The thing about microblogging is that, it’s easy and you get replies in the blink of an eye. The thing about blogging is that, you get distracted easilly. 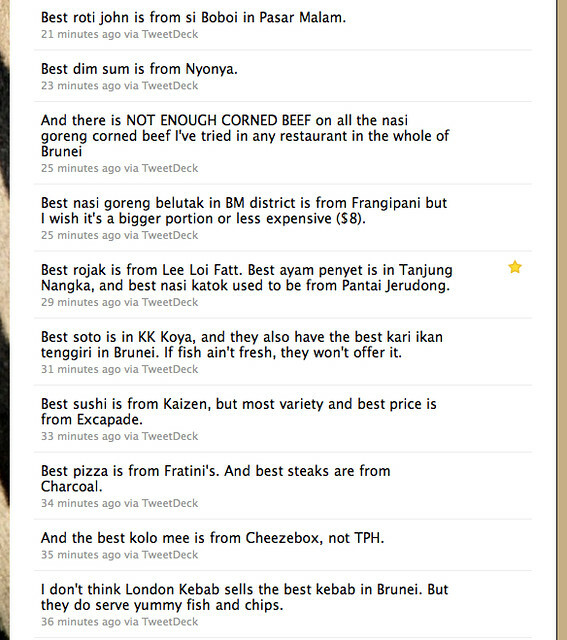 Just a few minutes ago I wrote down on THIRTEEN tweets the best food in Brunei, in my opinion. Best Korean BBQ is in Kimchi. Best cucur pisang is from the Thai restaurant in Bunut, with the one in Mulaut coming a close second. But remember the best things always come out of a loving kitchen.